If you have been searching for the perfect, go anywhere do anything travel trailer you will not want to miss out on the large selection of Airstream Bambi trailers for sale at Ewald Airstream in Franklin, Wisconsin. Here at Ewald Airstream of Wisconsin, we have a large selection of Airstream trailers for sale like the Airstream Basecamp, to Airstream Campers including the new Tommy Bahama for sale in Wisconsin. Here at your local Airstream dealer, we understand that each person that walks onto our lot has different wants and needs when it comes to travel trailers. Which is why our team is happy to answers any and all questions you may have about one of the many new and used Airstreams for sale. 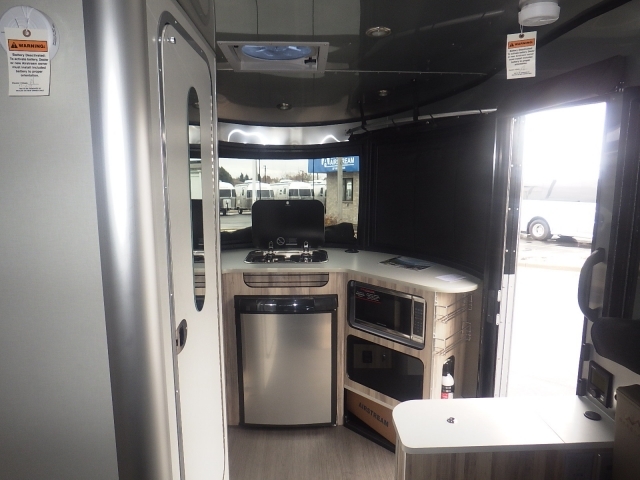 Whether you are looking for a travel trailer or RV, we have something for everyone, which includes a large selection of Airstream Bambi trailers for sale like the Airstream Basecamp for sale. This trailer for sale is ready to take you off the beaten path, and with all the amenities of a full-size Airstream you will feel comfortable and prepared no matter where you are. The Airstream Basecamp is apart of the single axle Airstream Bambi family, meaning it is light enough to be hauled by a crossover or a small truck but durable enough to take on the toughest of terrain. Do not let the tiny size of the Airstream Basecamp fool you because it is full of features to make your camping trips easier than ever before. The Basecamp is one of the most popular of the Airstream trailers for sale. This Airstream trailer is the perfect size for a couple or single person to take on a cross-country adventure. With an exterior length of 16’3” and a net carrying capacity of 913, this Airstream travel trailer can fit in those tiny spaces that other bigger more bulky trailers would not. This Airstream for sale also comes with a galley kitchen equipped with an oven, stove, and sink. The kitchen also comes with stainless steel covers for both the sink and stovetop, to give you extra space for preparing and serving food. Innovative storage features such as a bench with built-in storage space and converts into a half bed. Bungee storage on the door and server other spots lets your gear dry out as well keeps it out of the way. Pop-up charging stations keep devices powered up without taking up crucial space. The Airstream Basecamp also comes with a rear door hatch that makes packing up this trailer a breeze and with a sliding screen door gives you the perfect breeze. Optional rear and attachable side tents allow you to spread out as well as keep the bugs out in this Airstream trailer for sale. The Airstream Basecamp is ready to take on whatever adventure you plan next, and with advanced towing features, even the most novice of drivers can have confidence with this travel trailer. Come to your local Airstream dealer in Wisconsin and see the Airstream Basecamp for sale. 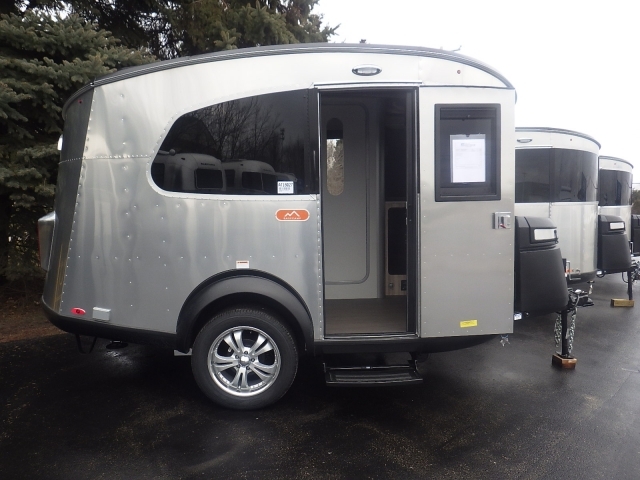 If you are looking for an Airstream for sale that will fit your whole family, we have a large selection waiting for you here at Ewald Airstream of Wisconsin. When it comes to finding an Airstream dealer near you come to Ewald's Airstream of Wisconsin at 6269 S 108th St, Franklin, WI 53132.